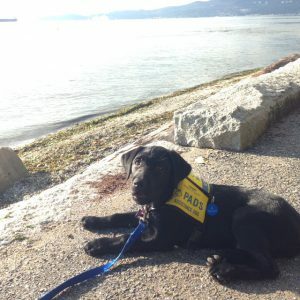 Our family has been volunteer raisers of Sloan , a Black Lab Assistance Dog In Training for Pacific Assistance Dogs Society (PADS.ca). Sloan as in Dr. Sloan from Grey’s Anatomy – all the pups from his litter where named after characters from the show. I wrote a blog post titled Why Pads? that goes into how we ended up involved and some of the pros and cons. (Hint: Just about anyone can get involved so take a read if you are curious). As part of our journey with PADS we attended PADS Graduation. Graduation day is a celebration of sorts to help the PADS Volunteer, donor, sponsor and benefactor communities gather together and share on some of the successes of the program. 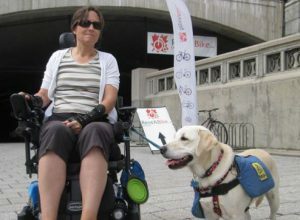 Even though we have been involved a few months and understood the obvious and more expected support of disabled peoples that PADS Service Dogs provide there were a number of areas that I did not realize the benefits. A few I wanted to highlight here could easily impact every one of us and our families either directly or indirectly. The Graduation Commencement Speech was given by Anthony Ciolfitto, Principal, Riverside Secondary School in Port Moody. Amanda Todd had been a student at his school before switching schools due. In the period of 4 months they lost 4 young lives at that school. As he put it the impact was enormous and he felt he needed to do something. So he applied for a PADS dog to serve as an intervention dog within the school. His speech was insightful and moving. He talked about how just simply walking down the hall in the morning brings smiles to otherwise dark looking faces. 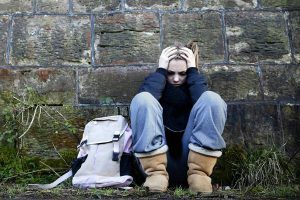 How when dealing with a troubled youth bottling up all the critical details, they can unlock them in 15 minutes in cases where it was hours otherwise. How shortly after receiving their PADS puppy his daughter was in her room distraught over some life events and upon seeing her, the pupply went off to find one of her stuffed toys, brought it back and put it up on his daughter’s lap. He has seen a remarkable difference in his school, with students and even with staff. It is a great example of how one dog can help so many so easily by just being there. 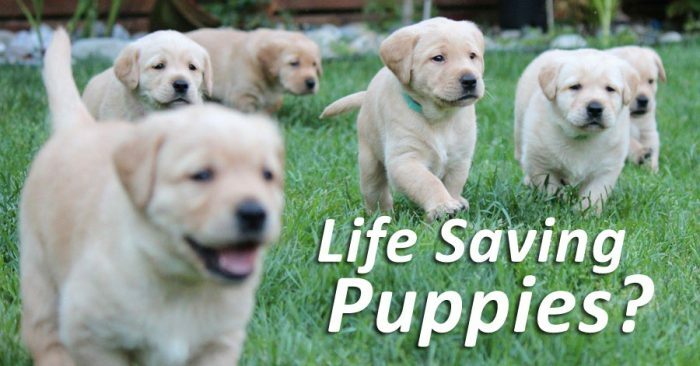 If a PADS dog can save one young life. Help one young person avoid a dark or self destructive path, all of society gains. Our oldest son just started High School. Within 5 minutes of the first day we experienced just what a land mind these schools can be for our youth. One of the other graduates was joining the victim services branch of a local police force. These dogs provide an incredibly valuable service to society in being able to support children and adults during and immediately after tragic events. Brought in to provide comfort and distraction they have a remarkable ability to sense and help dissipate the distress a victim is often experiencing. They are also brought into court houses to help young victims during testimony as well as support to psychology counselors for situations like the return of residents to Fort McMurray after the fire but also the crews that had to work to try and protect the town somewhat in vain. Any of us could have that sudden life changing moment that has us surrounded by strangers and being snuggled by a PADS dog. Sometimes the dogs in the program for one reason or another are not perfectly suited to being an official service dog. For example, a dog that is eager and insists on pulling on his leash is not well suited to someone in a wheel chair or other physical disability or to be with children. However an veteran or first responder suffering from Post Traumatic Stress Disorder has been shown to benefit immensely from having an assistance dog and typically has the physical ability to handle such a pup. In other cases they go on to help families or situations like the 16 year old boy that has fought cancer since the beginning and has had anything but a normal child hood. 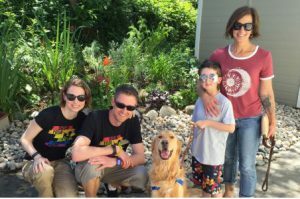 There are so many stories and so many ways that a PADS dog gives back to society. For some amazing pictures and more great stories read the September News Letter. My family has an unusually high number of wheel chairs in it. My step-mom has severe MS. My father-law became sick in his 30ths and never walked again for reasons still not clear. My sister Sheri was hit by a train while in her work truck as a flagger one early cold December morning 5 years ago. She suffered brain damage among other things and while she to this day continues to oh so slowly improve she still can’t speak or hold her self up, walk unassisted or hold items in her hand correctly. I don’t see her as often as I should but on Thanksgiving at my mom’s my sister was there and so was Sloan. 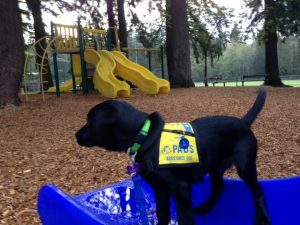 It was fascinating to see that even at only 13 weeks old with no specific training, how perceptive Sloan was to Sheri’s disabilities. He sat still and close enough to her that she could reach him. He was relaxed and not super excited like he usually is around a large number of new people, my parent’s dog or a new place. He was calm, patient and attentive for a good 10 minutes. An eternity for 13 weeks old. Only when I released him from being with her did he turn into the excited puppy I expected him to be. I was in awe of just how special these dogs are and have come to realize just how valuable not only these dogs are but how important PADS is as an organization to making society and the lives of the less fortunate better. Not just on a 1 for 1 basis but the 1 to many as in the case of the intervention and victim services support dogs. We are sad to have Sloan move on to another raiser in Indiana after only 2 short months. Through this journey we have found a place where we get to give back and help in a way that benefits the greater good. All we have to do is provide a loving warm place for a young dog with a purpose in life and coach them along their journey. At the same time we get to selfishly enjoy the many wonderful experiences of raising a child in a sense that will serve a purpose greater than most any of us ever will. Lastly we can proudly see him go on to make a real meaningful difference in someone’s life every single day. All while making new friends and connecting with many outstanding like minded people. Read my blog post about our journey to see if you might be help to handle getting involved. It is not for everyone. But everyone can spare an extra $20 to support such a worthy cause. I encourage you to help how you can. You, your child, your parent or a friend could very well be the real benefactor of your small donation. A portion of the proceeds of every mortgage I funded is donated to PADS!